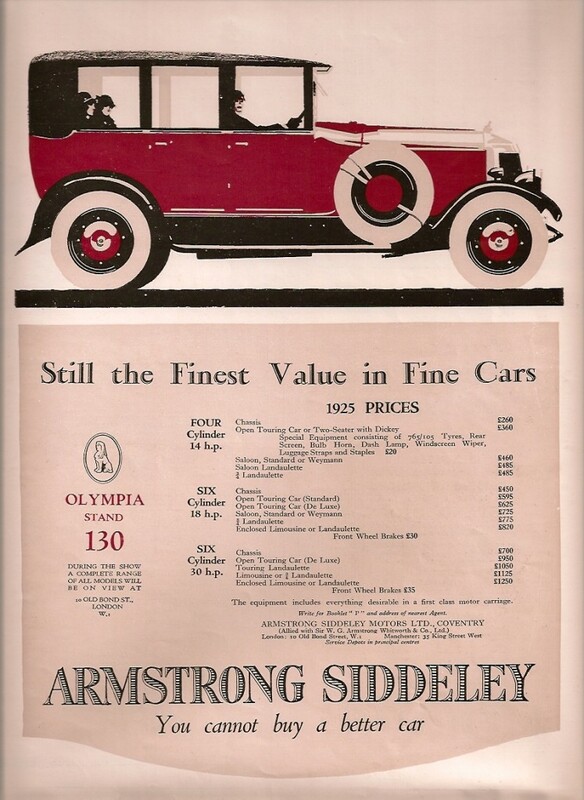 The first model that the newly formed Armstrong Siddeley introduced in 1919 was the 30 HP model. This was a large car with a six cylinder engine of nearly five litres capacity (4,960cc), roughly equivalent of five Mini or Morris Minor engines. The chassis was designed to take quality coachwork often made by Burlington, Armstrong Siddeley’s own coach builders, but also by many of the UK’s leading coach builders. Typically the chassis would have a tourer or saloon body, but there was a whole range of styles made. The chassis wheel base (distance between axles) was 3.43 metres (11ft 3in), the track (distance between wheels) was 1.42 metres (4ft 8in) and the overall length 4.99 metres (16ft 4 1/2 in). Advertising the 30 HP Armstrong Siddeley at the Motor Show at Olympia, London in 1919. 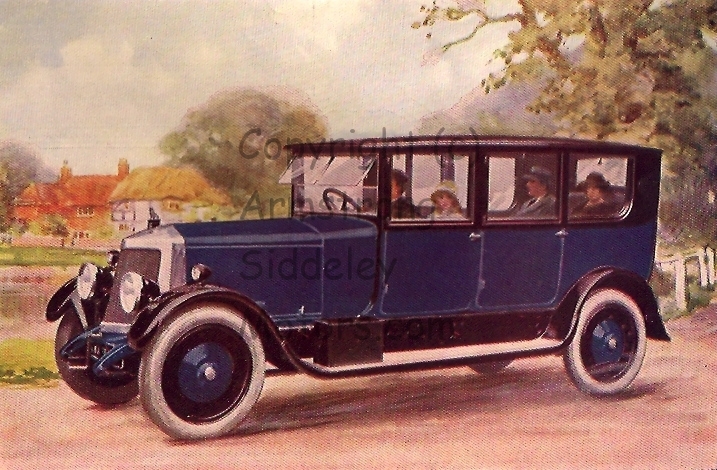 This image was published in November 1919 and is an artist’s impression by Godbolds of the saloon car. Armstrong Siddeley was just starting production and was introducing the new car at the Motor Show. The new owners of the 30 HP received a detailed instruction book explaining how to maintain and repair the car. In most cases this would have been done by the chauffer who was responsible for looking after a car costing around a £1,000. These illustrations show the driver’s view, first the Mark 1 design, and then the later Mark 2, which was introduced in May 1925. The Mark 3 cars were made from 1928. The 30hp remained in production until 1932 and over 2,700 cars were made in that time; the majority of these were Mark 1 cars (2318). A similar set of instruments was supplied with both models: clock, oil pressure gauge, ammeter and speedometer. The later dashboard is very deep and now has two glove pockets. 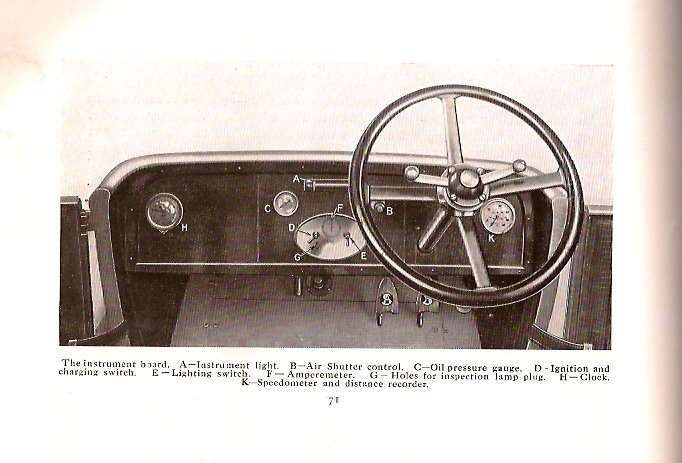 Note the rubber bulb for the horn on the right, which is addition to the horn button in the centre of the steering wheel. The petrol gauge in the centre is outside the car on the scuttle mounted petrol tank. 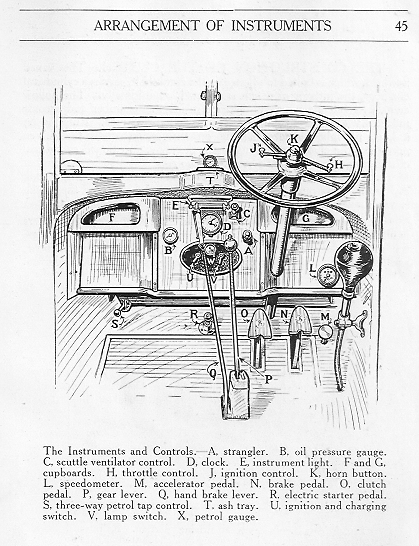 The letters refer to: A Choke, B Oil pressure gauge, C Scuttle ventilator control, D Clock, E Instrument light, F and G cupboards, H Throttle control, J Ignition control, K Horn button, L Speedometer, M Accelerator pedal, N Brake pedal, O Clutch pedal, P Gear lever, Q Hand-brake lever, R Electric starter pedal, S Petrol tap (three-way), T Ash tray, U Ignition and charging switch, V Lamp switch, X Petrol gauge. 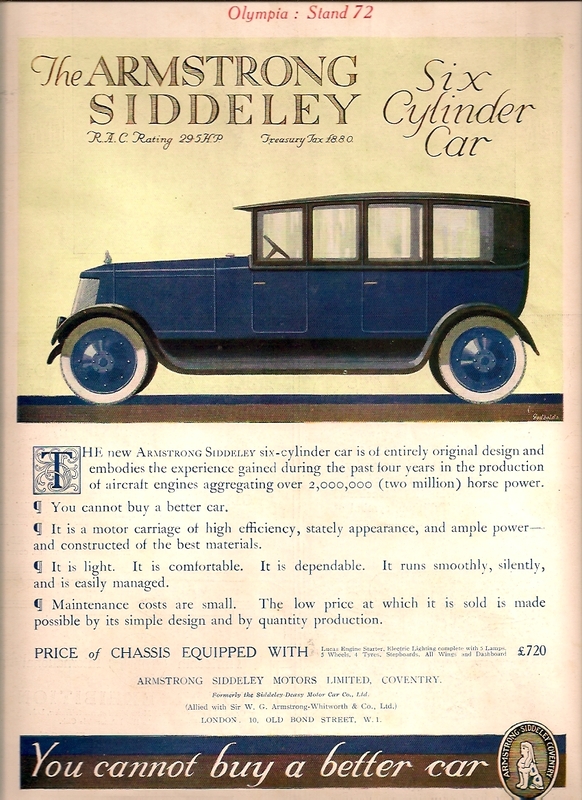 Armstrong Siddeley used this image to advertise the 30 HP in November 1920. The body is a limousine-laundaulet. The chauffer has little protection apart from the windscreen. 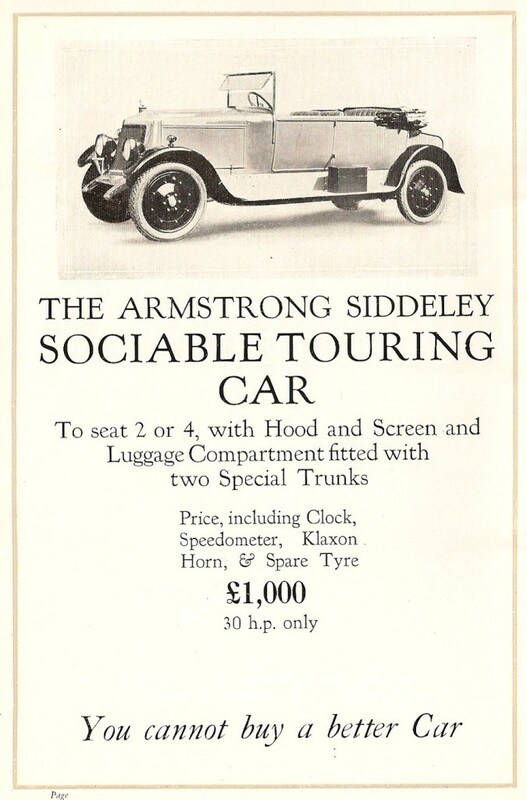 Below is the 30 HP sociable tourer from the 1921 brochure. Below that is a very rare photograph of this body which had two or four seats and a luggage compartment behind. It’s not surprising that no example survives of such an unusual body. By 1922 Armstrong Siddeley were advertising the smaller 18 horse-power car (shown here with a tourer body) alongside the 30 HP. 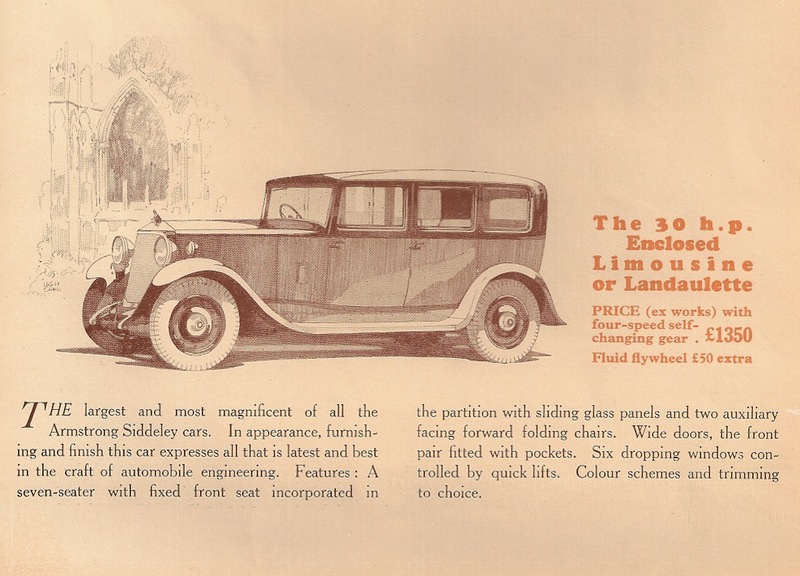 Armstrong Siddeley used this lovely image to advertise the 30 HP in November 1923. This was in the company’s advertisement for the seventeenth international Motor Exhibition at Olympia in London from 2-10 November 1923. 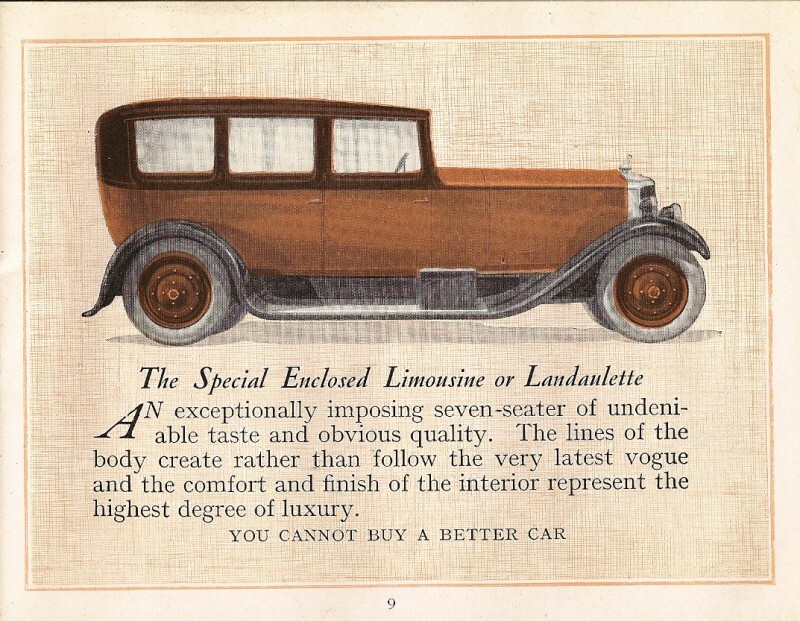 The price of the car was £700 for the chassis, £950 for the open touring car, £1,125 for the landaulet or limousine, and £1,250 for the enclosed landaulet or limousine. Armstrong Siddeley’s advertisement for the 1924 Motor Exhibition in October 1924. The company was advertising the prices for the following year, 1925. 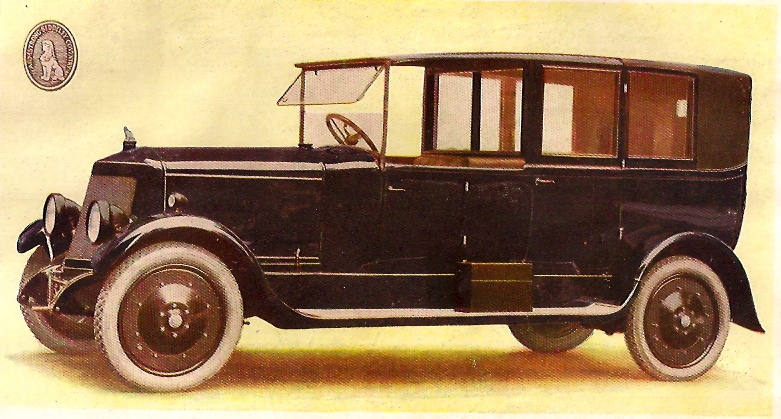 Two images below of the 30 HP from a catalogue issued by Armstrong Siddeley in 1928, showing the 1929 model range. The first one is the the enclosed limousine or landaulet made by Hooper, one of the UK’s best and most famous coachbuilders. 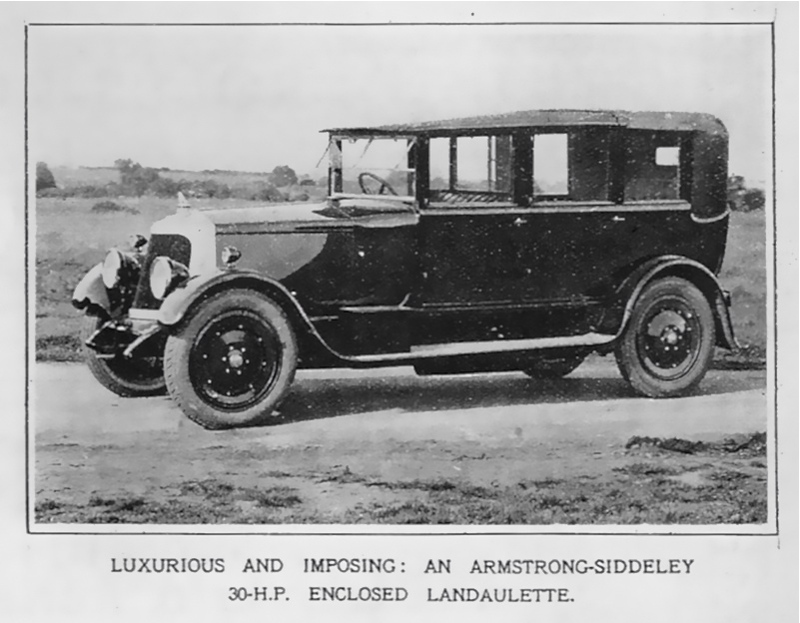 The body on the second car was probably made by Armstrong Siddeley’s own coachbuilders Burlington. 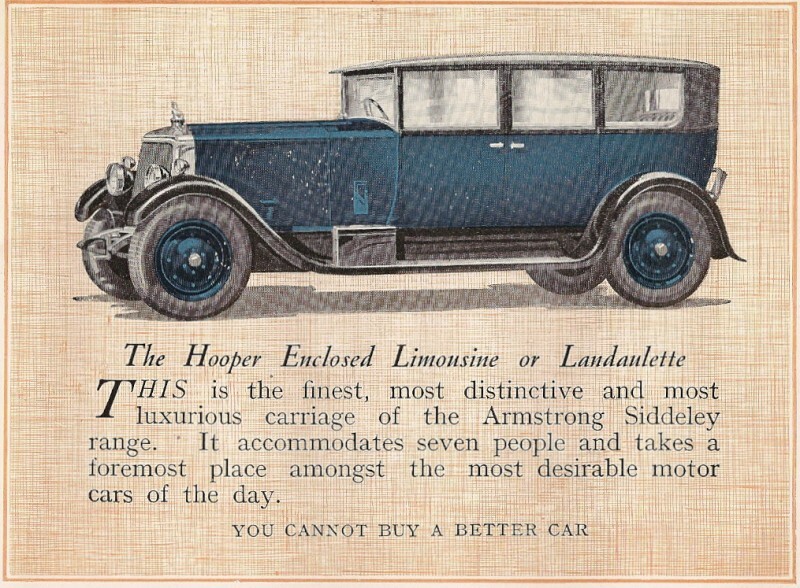 The Hooper body is more traditional in design than the Burlington car, though both have a higher door line than the cars from the early 1920s. By 1931 Armstrong Siddeley had modernised the 30 HP which had a deeper radiator, new wheels and a more rounded appearance. It was by then looking increasingly out of date and was sold in small numbers only. There was a cica 1924 big siddley landaulette in Toowoomba Queensland Australia for sale in 1960, it needed only minor restoration, but the last I heard of it it was a pile of bits behind an old garage half way up the Toowoomba range. The garage went many years ago. Thank you for telling me about the landaulette. Sadly, there are very few surviving 30HP and 18 HP cars from the 1920s. I apologies for being slow to reply. Great History! In 1941, an auto buff in Pottsville,Pa. had one which was certainly impessive by size and eye catching by being out of date. Is there anything published on the Armstrong-Siddeley stationary engines. I haye a 30 hp air cooled diesel in excellent condition which is belted to a English made12KW generator. I am looking for a Lucas starter motor for it. Hello, I have 8 Armstrong Siddeley bonnet mascots (all different) and several badges. Is there anywhere I can acurately identify which model car they would have come from? 1. 1919-1931 the mascot was a sitting Sphinx used on all models 30,18,14,15, and 12 horse-power. This was in two sizes: 3 inches (75mm) and 3.5 inches (90mm) and usually the larger one was just used on the 18 and 30 HP cars, though I have seen it on the 14 HP as well. THe mascot was on the radiator cap and the name Armstrong Siddeley was in two lines below on a blue enamel plate that curved round the upstand on top of the radiator. In 1931 the upstand was less deep and the enamel plate was more horizontal. 2. 1932-1935 approx, the mascot was lying down, looking forward with paws apart and outstretched. The cap had ridges around the edge. The name was below in one line. 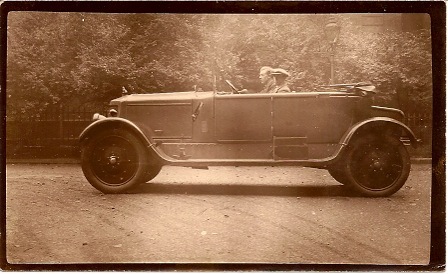 I have seen some post-1931 cars with sitting mascots – perhaps some owners preferred this and it was offered as an option. The Siddeley Special had a nameplate with Special on it. 3. Later in the 1930s, 1935-38 I think, the mascot was a bit more streamlined with a rounder head and placed on a plinth with a stepped front. This was no longer part of the radiator cap, though it was placed above the radiator. 4. 1938-39, just before they abandoned production during the Second World War, the company put the mascot on a plinth with a V front. In 1939 it may have been put on a round cap but I don’t think these last models were ever offered for sale. 5. When Armstrong Siddeley introduced the new models after the War, named after the wartime aircraft, Lancaster, Hurricane etc., the mascot was an Art Deco ‘Sphinx’ with helmet head, fixed to the bodywork over the radiator. 6. The Sapphire introduced in 1952 has an amazing mascot with rockets on either side of the head. 7. 1955-58 the Sapphire had a new mascot with stylised Sphinx. We are vintage cars enthuciast and restoring a Armstrong siddeley 30 HP of 1912model, covertible. We did the caoch work and we are in need of Magneto, Radiator, self starter, Ignition coil Carburettor etc. If any one have please mail with the cost. Hello, Many thanks for the information. That’s a great help. Frustratingly, one seldom sees the mascots in enough detail in photos of cars – which is understandable because the car is the subject, not the mascot.